Sunday turned into FOOD-DAY. Not sure entirely how it happened but here’s a recap with some recipes mixed in there. After a few hours of perusing Joanne’s fabrics in search of a project to take on this summer (my friend Sara and I have started a summer bucket list of things to do… more on that later), we headed back to our neck of the woods for some lunch. 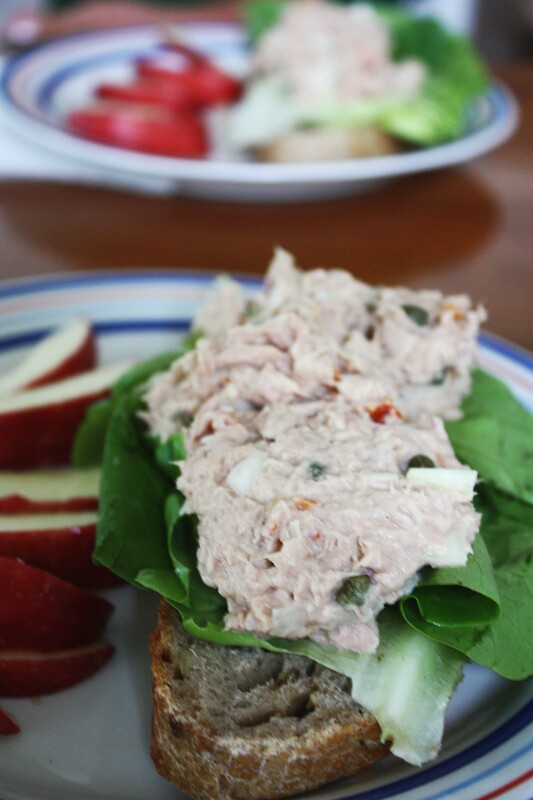 Open-faced tuna sandwiches on multi-grain sourdough. I haven’t had tuna salad in about a million years but this was great: tuna, lemon juice, dijon mustard, mayo, capers, sun dried tomatoes, onion and carrot. Not sure what else we could have possibly fit in there, but we kept adding random stuff in the kitchen. Regardless, all sorts of delicious and most definitely making this again soon (mostly because it was so darn easy). Let me just tell you, this lady knows what she’s doing. 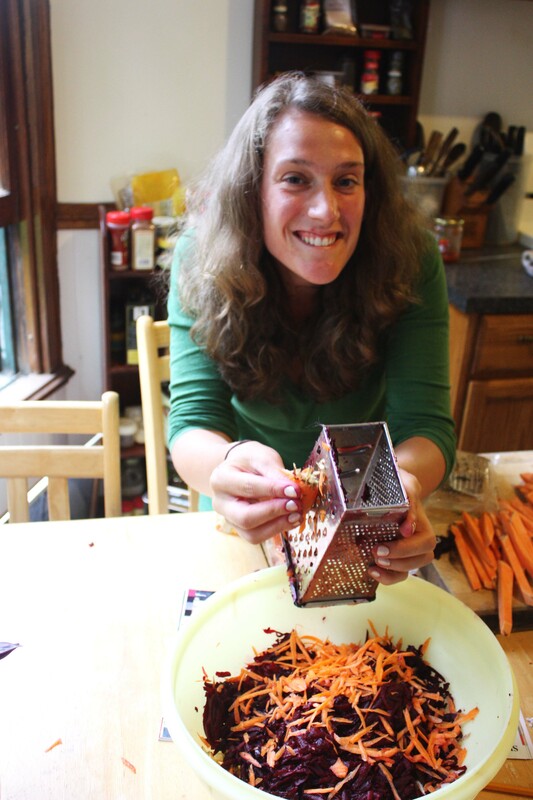 She made Carrot Beet Burgers that were AMAZING! I don’t know the exact recipe but here’s roughly what was in them: grated carrots, grated roasted beets, grated tofu, sunflower seeds, brown rice, soy sauce, cayenne, oil, eggs and cheddar cheese and maybe other things I missed while I made other things. All combined together and formed into patties then baked for about 30 minutes. I think she may have been inspired by this recipe, but she did it from memory without measuring so I can’t be sure. 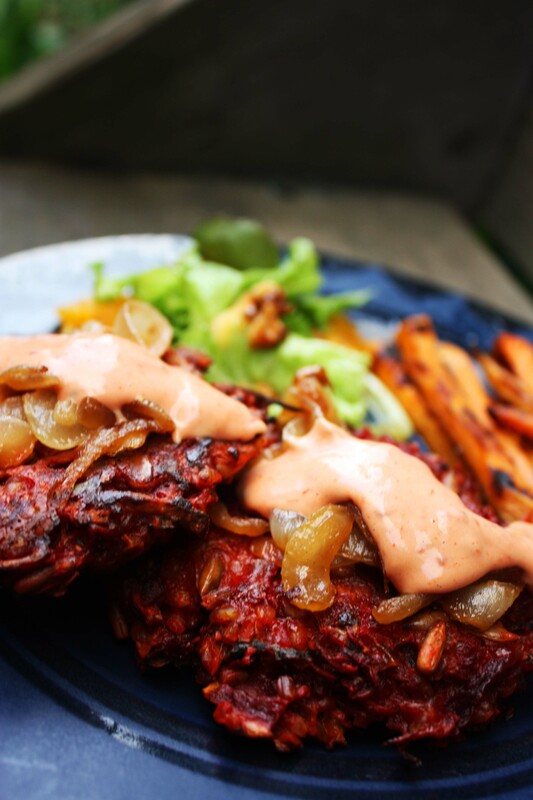 The burgers were topped with caramelized onions and served with sweet potato fries, “chipotle” aioli (combo of mayo, tomato sauce, red pepper flakes, cayenne) and a tasty salad (lettuce, candied walnuts, oranges and a simple balsamic vinaigrette). Oh goodness. All sorts of amazing. Sara, you are a star. 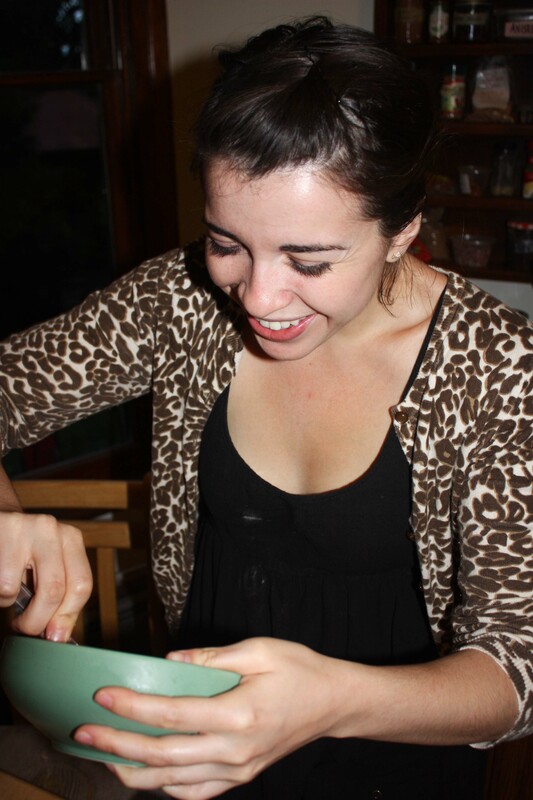 While Sara made the Carrot Beet Burgers, I made a birthday cake for one of her housemates. Not my prettiest picture but I’m pretty sure the cake was darn good. Preheat oven to 350. Cream together butter and sugar. Add coconut milk and combine until fluffy. Add flour, baking powder and salt. The batter will be really thick. In a separate large bowl, beat the egg whites with a mixer on high until you get firm peaks (meringue essentially). 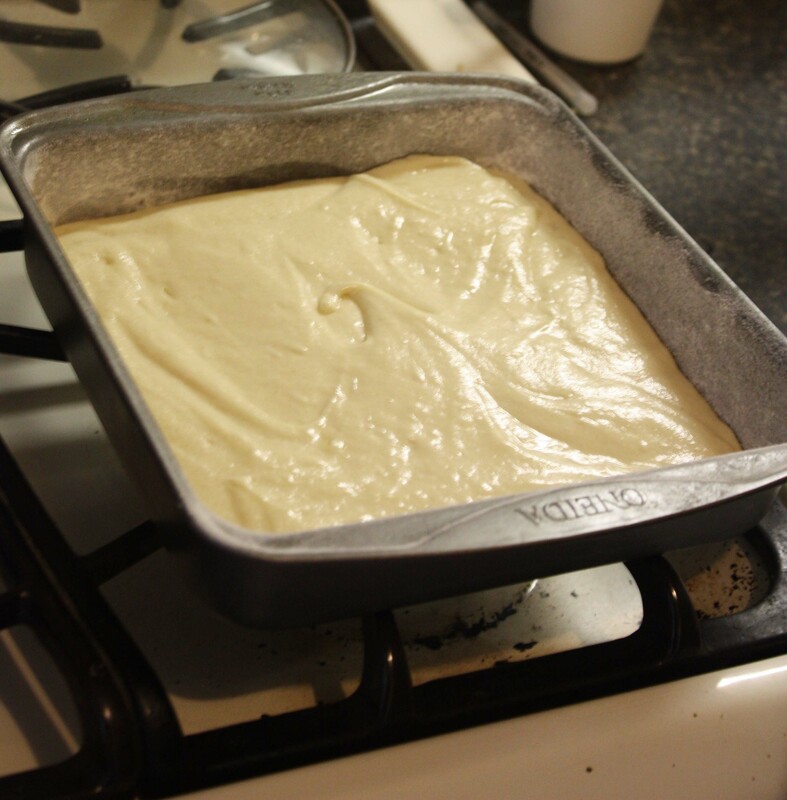 Fold egg whites into batter and transfer to two greased and floured baking pans. Bake for about 40 minutes. In the meantime, make the lemon filling. Boil water in a large pot to start you double boiler (unless you have an actual one), in metal or glass bowl that will fit over the pot combine egg yolks, butter, sugar and lemon (juice and zest). Place on pot, make sure the water doesn’t touch the bottom of the bowl. Cook and stir occasionally until the mixture starts to thicken. 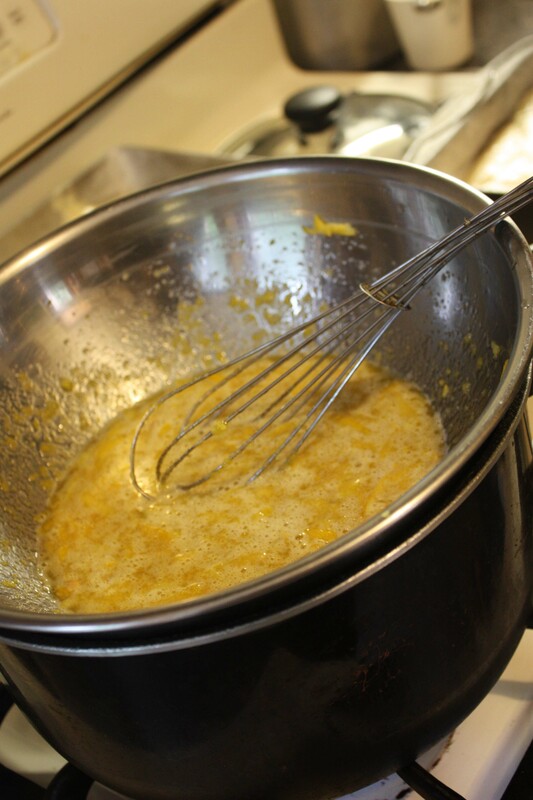 Then pass through a sieve and refrigerate for a while for the lemon curd to thicken. Start by creaming the butter and sugar, add coconut milk to get the right consistency. If it’s too runny add more powdered sugar and vice versa. Enjoy it a little too much? Anyway…Place the first layer on a plate/dish/etc top with lemon curd (stir it if it’s been refrigerated for a while), add the lemon curd to the center of the cake. Try not to spread it too close to the edges or it’ll start to fall over the edges. Press down the second layer. 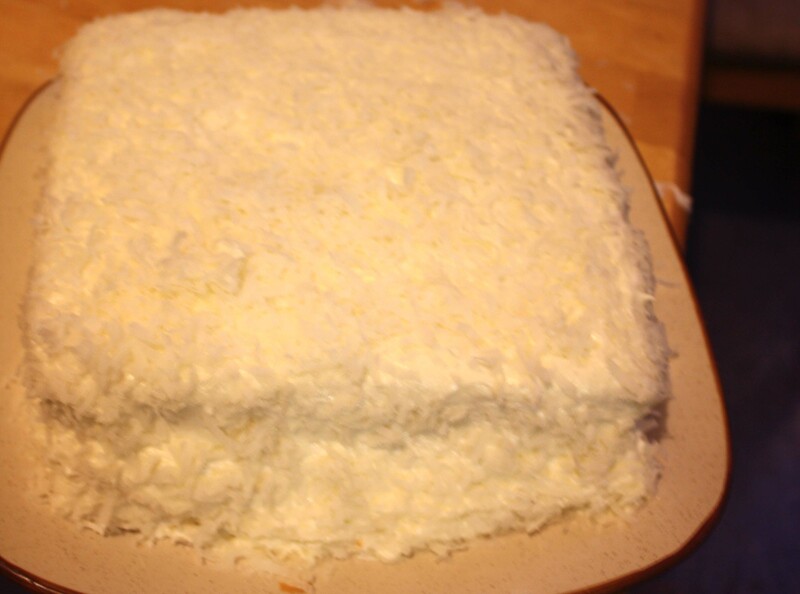 Frost, then press on shredded coconut. Now I’m pooped from all this cooking and eating. Need to go to bed so I can get up bright and early for a date with the gym! Yum!! Those burgers sound really tasty! And I think your cake looks very pretty! Wow, that meal for 14 people is so impressive, not to mention beautiful! Love it! Those pictures are beautiful, especially those burgers. Holy good eats Batman! 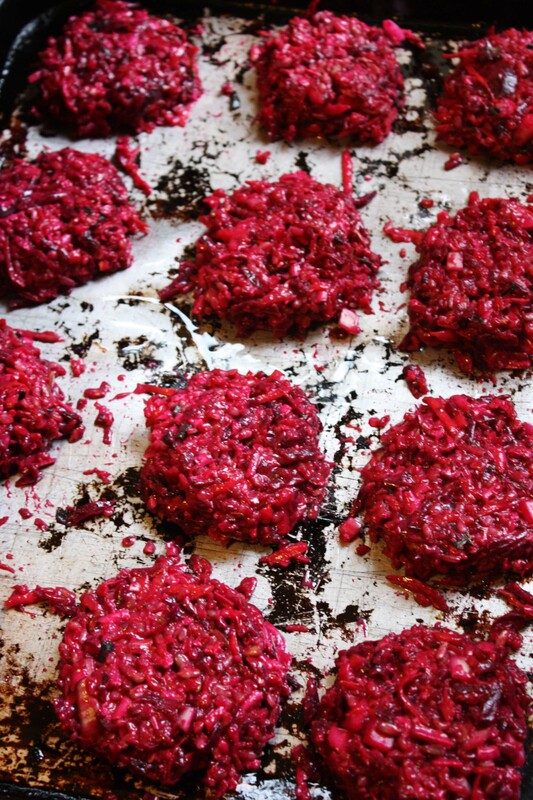 I don’t even like beets but really want to make those “burgers” now. I am curious about the bucket list now! That is a pretty picture of the cake!! 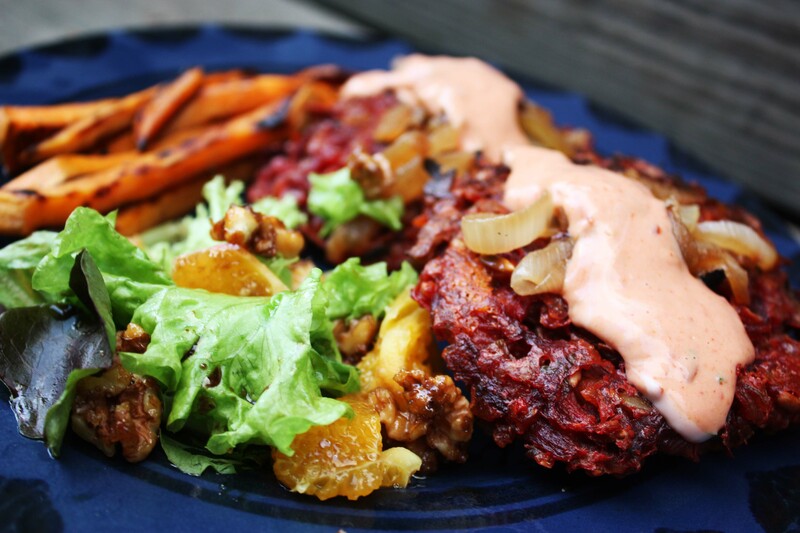 It looks good and I’ve never heard of carrot beet burgers. 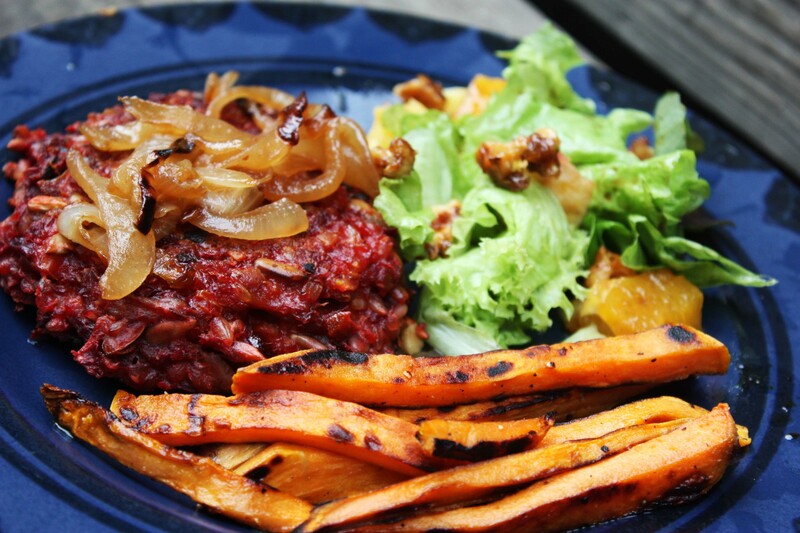 They kind of look like raw beef but in a good way!! They photograph awesome and now I need to try them. what great food! i haven’t had tuna salad in forever either but that is about to change thanks to your inspiring post.